The Yowza largo elliptical trainer is the budget priced model in the Yowza line up. Eliminating rollers, the experience is smooth, quiet and stable in spite of the compact footprint. Stride length is an adequate 18”, and maximum user weight is 331 lbs. though as always subtract at least 25 lbs. The unit weight of 121 lbs makes this trainer easily movable. Separate handlebars provide an upper body workout. Footpads are cushioned and pivot for comfort. Select from 12 different programs and 16 resistance levels which you can change using controls located on the moving handlebars. Heart rate can be monitored 2 ways, through embedded sensors in the handlebars or using a heart rate strap. Very nice features include water bottle holder and Ipod/MP3 docking station that plays through Hi Fidelity speakers. Warranty is a superior lifetime on the frame, 3 years on parts and 1 year on labor when compared to other competitively priced models. 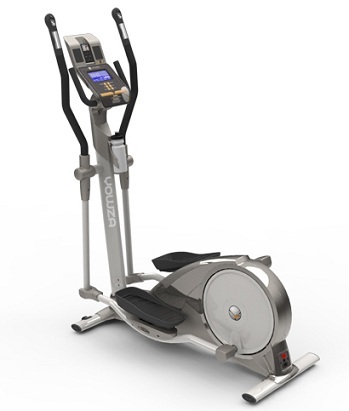 The Yowza Largo elliptical trainer packs a lot of quality and extras into an attractive price, makes this a good value if you are looking for an entry level trainer that perform better than you would expect.